Detailing the physical features, habits, territorial reach and other identifying qualities of the American Copper. Though found on other continents, the American Copper is one of North America's most popular and wide-ranging butterflies. 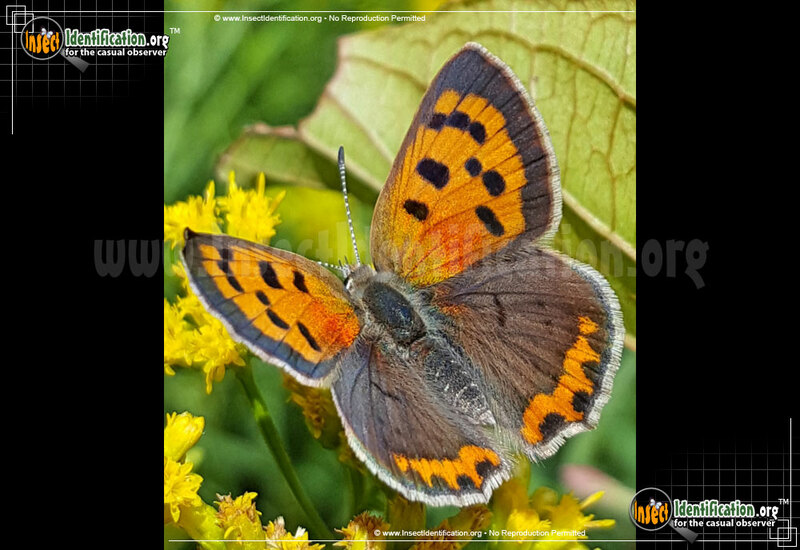 Thought to have emigrated from Europe, the American Copper adapted well to its new home. Ranging throughout almost every state and province, the American Copper is ubiquitous, and can be found in a variety of habitats. In the east, look for them in fields and pastures as well as roadsides and meadows. In the west, look for them in higher elevations on hiking trails and outcroppings of vegetation among the rocks. Adults are active from mid-spring through the end of autumn. They drink nectar from a variety of flowers like clover, yarrow and buttercups. When resting with wings flat, one can admire the bright orange color that covers most of the forewings of the American Copper. The hindwings are mostly brown with a faint black circle near the midline on each. Both sets of wings are bedecked with medium-sized black dots; spread out on the forewing, and along the bottom edge of the hindwing. A white fringe borders all wings. When the wings are raised, The American Copper looks like an altogether different butterfly. The rich tawny brown is replaced with whitish-gray. The underside of the forewing is still largely orange, but the hindwing is mostly gray with three rows of small black dots. A thin, bright, orange-red line traces the bottom edge of the hindwing near the fringe. Caterpillars of the American Copper are fond of eating the leafy parts of sheep and alpine sorrel, a plant from the buckwheat family. Curly dock, another ground-level leafy plant, is also preferred. Their bodies are green and plump, completely covered in very short hairs. The side of each segment has a tiny yellow dot and its tail end tapers. Two to four broods can be produced in one year with more occurring in the warmer states of the U.S. and Mexico.